If I only have an extra one thousand dollars, I would have paid for hair extensions, a long, full head of hair would be nice. But since I don’t, I would settle for my good old small choice of wigs. Pretty soon, I will be going out without a wig every time without any cover over my short hair. Look at me. I am almost ready for a hair cut. Want hair extensions? Watch this and admire. Going to the clinic brings me memories just five months ago and back–my multiple visits for shots post chemo, my sick visits due to low resistance to infections, and lab work. Each visit, I felt weak and unconditioned. I did not want to be here. I still don’t want to be here. Today, my son woke up with swollen left eye and cold symptoms–sore throat, runny nose, and general malaise. All that and he still wanted to work. I still did not let him and called in sick for him. Because I called and said that he is sick, he is excused and he is not losing his little job, my thirteen-year-old. 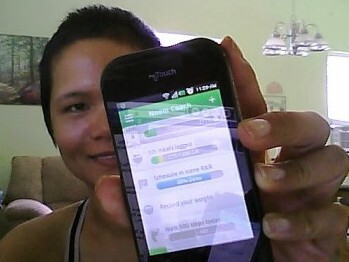 I got this Noom application from Google Play, an Android app to help me lose weight. It has been a month, and I lost six pounds. I have tried other applications and methods before, but I like this one the most so far. It helps me roughly track my calorie intake from good food to not so good food that I should limit. Take a peek, here. If you have an Android phone, it does not cost you extra to use the free app. It gives me daily motivation and reminds me to walk daily. I use it with an exercise app. I will write about that later. For those of you in treatment, chemo or radiation, it may not be good time to lose weight even if you want to. You need all the nutrients to replenish damaged cells. That means eating more nutritious foods that you can tolerate and keep down. My dentist thinks the cavity (along the gumline) started because of mouth dryness and poor brushing in the area. Well, I believe him. For months during chemo, my mouth and gums felt raw. The electric toothbrush I have been using for years suddenly became unbearable. It felt like my teeth would all fall off from the vibration. I was using this extra soft toothbrush ever so carefully for months but apparently, the gentle strokes did not get the bugs and plaque off my teeth, oh well.